Sometimes the coincidences that life throws up are both spooky and delightful, rather as if some good fairy has taken charge of things for a change. A while ago now I was reading the Bwars forum messages which come regularly into my inbox and noticed a message from Leslie in South Lincs. I don’t often see questions from my part of the Uk so I was interested in her report of her B ruderatus sightings. That afternoon, I went out into the garden with my camera and there drifting slowly from one clump of Yellow Archangel (Lamium galeobdolon) to another was a large velvet black bee. Very big and very black. My bee knowledge is still slight but I knew it was a Bombus and not an Anthophora. When I looked again at the books it could only really be Bombus ruderatus. A very odd occurrence as only that morning I had been reading about them. This is the dark form of the lovely ruderatus (var. harrissellus) which has, it seems, quite a few colour variations. She is carrying some yellow pollen and had a dusting of pollen on her head from the flowers but apart from that I could not see any other coloured hairs. They don’t seem to be very common, but apparently have a bit of a liking for Lincolnshire. This is from the UK Biodiversity Action Plan site. “Although this bumblebee was considered to be very common in southern England at the beginning of the 20th century, by the 1970s it was already considered a scarce but widespread species. 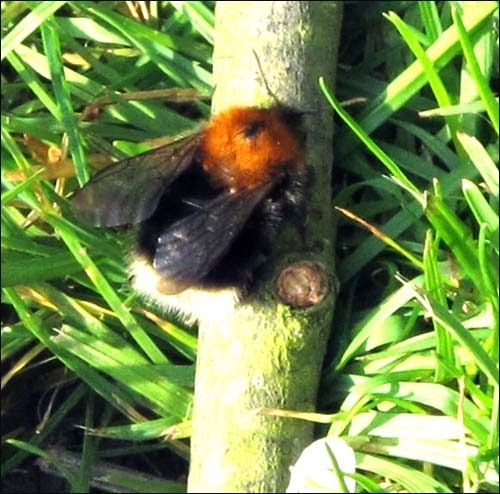 The decline has continued since, with fewer than 10 confirmed post-1980 sites for this bee, mostly in East Anglia. There are no confirmed post-1960 records for Wales and no records for Scotland or Northern Ireland. This bee is widespread but declining in Europe. Buglife have a good “species management” sheet for more information here. and Bwars records have a distribution map here. If any other Lincolnshire readers see this bee, Alan Phillips ( norwegica blog) would like to know! Being a long tongued bee it likes red clover which you really don’t see so much of these days. Another coincidence is that this beautiful long faced and long tongued bee was one of the hopefuls sent to New Zealand to pollinate the red clover crops in the 1960’s. Studies were made of their nesting habits in Lincoln .. but Lincoln, New Zealand not Lincs UK. I have subsequently called in to see Leslie and to talk to her about her bees. Her lovely garden was just full of them with bee houses/ nesting sites and bee flowers everywhere. She has been recording bees for many years and her records are fascinating. Identifying this particular species is tricky because of the many different colour variations and its similarity to B hortorum to which it is related. I think I am going to try to make a chart. I saw the black queen just once more before we moved and I think this is another bee I will have to add to the British bee set. Nice bee find in your garden. A pretty specimen. Your illustration is wonderful. Wow! I love the black queen and your Yellow Archangel shots. Great post Val. Thank you! this helped me to confirm the ID of a beautiful black bee that was enjoying the flowers on my sage plants this morning. Bombus hypnorum, here, there and everywhere.